The most intriguing thing about Rupert Wyatt’s new film, Captive State, is that unlike most sci-fi films, it picks up after an alien invasion. It’s the story of a world where aliens invaded, humanity lost, and now they are our rulers. Of course, in that scenario, some people would want to rise up and fight the oppressors. How it’s handled, though, is somewhat in opposition to what you may expect the film to be. This is not an over-the-top, kick-arse action movie. The science fiction elements are handled very realistically with some of the most audacious ideas off-screen, and the aliens, for the most part, pushed to the side. If anything, Captive State is more of a ‘70s political thriller with sporadic heist elements, showing the intricate steps taken by a small group of strangers to come together and strike a blow against an evil hierarchy. Which, considering today’s political climate, rings a little more than true. 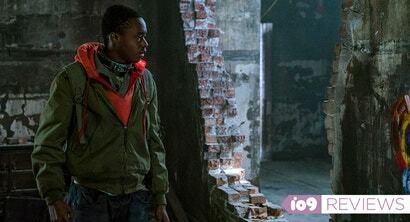 At the center of Captive State is Gabriel (Ashton Sanders), a young man living on the outskirts of the law. He’s trying to get by the best he can and maybe even escape the confines of Chicago with his girlfriend (Madeline Brewer). He also happens to be the younger brother of a legendary freedom fighter (Jonathan Majors) who was killed the last time humans rose up against the aliens. Then there’s William Mulligan (John Goodman), a law-enforcement officer who is on the tail of a mysterious terrorist group called Phoenix. Mulligan believes Phoenix is poised to strike once again against the alien “legislators,” just like when Gabriel’s brother was killed several years ago, and he’s set on stopping them. Captive State weaves those two stories, and several others, together into a what can almost be described as a shiny object narrative. Much like an animal that’s doing one thing, only to immediately stop because they see something shiny, the film jumps from one character or one story to another almost without notice, which often times is jarring. Everything is fluid. Main characters drop out of the film for long stretches of time only to resurface later once the story has a need for them. Characters we don’t know are introduced with little fanfare, making them feel like they were already part of the story. Intriguing bits of mythology are mentioned but never explored. All of this gives the whole movie a slightly incomplete, unfocused feeling because we aren’t always sure what we’re watching or why it’s important. Thankfully, that confusion can be equally fleeting because Wyatt and his team frame it all within a fascinating and terrifyingly familiar surveillance state. Every human is implanted with a tracker which makes walking down the street, let alone committing crimes, difficult. That construct results in all variety of exciting scenes, ranging from tense to gruesome. They also help keep the film incredibly unpredictable, which is at times liberating but also frustrating, like when a character slips into a super cool mysterious world that we never get to see. Much like the film has a mysterious quality to it, so too do some of the performances. Goodman’s character somehow always feels like he’s one thing while showing us he’s the opposite. Sanders’ character is structured to be our hero, but really never feels that heroic. Oscar nominee Vera Farmiga also has a key supporting role and, like her co-stars, delivers a performance with different layers of truth both on the surface and below it. Each exhibits a delicate balance of duplicitous that keeps us guessing about their true intentions, which works in tandem with the rest of the movie. Ultimately though, Wyatt and co-writer Erica Beeney know what they’re doing. Every little detail is working toward something very specific, and the film’s third-act reveals bring it all together in a way that’s both incredibly satisfying and extremely layered. Captive State begs for a cup of coffee after, not just to discuss the complexities of the narrative, but also its overt political metaphors and symbolism. Which is to say, Captive State has a lot of things going for it while also feeling like it could have been more. There’s tons of potential left on its edges, ignored in favour of a dense story that’s maybe too thematically familiar in these times. The film has a lot to say, but it’s rarely more than we see on the news every night. Luckily, there are enough cool and weird sci-fi elements sprinkled on top of that that give Captive State plenty of intrigue and entertainment to go with the allegory. 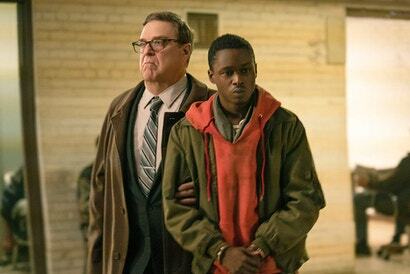 Captive State opens March 15. Check back soon for our interview with director and co-writer Rupert Wyatt.